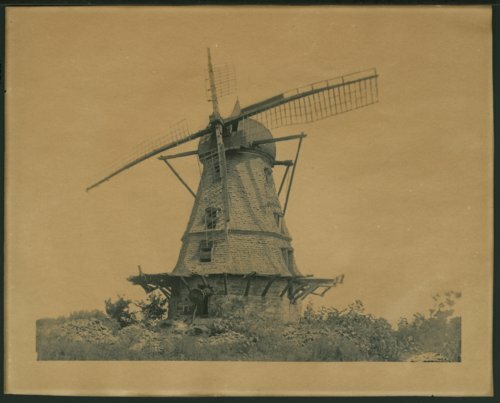 This is a cyanotype showing the old Dutch windmill, which stood on West Ninth Street in Lawrence, Kansas. Construction on the windmill started July 1, 1863 by Andrew Palm and John H. Wilder. Fourteen men were brought from Sweden by Palm to build the windmill. It was destroyed in Quantrill's Raid and rebuilt in 1864. It was octagon shaped, four stories in height, and the basement had walls of stone six feet thick. The mill had four millstones, two for wheat and two for corn. The capacity of the mill was twenty bushels daily each of flour and meal. With the wind blowing at the rate of twenty-five miles an hour the mill would have eighty horse power. The mill ceased running in July 1885 and a fire destroyed it in 1905.